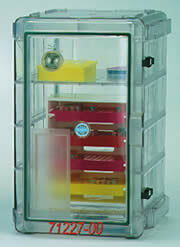 Pick the SECADOR™ DESICCATOR CABINET that suits your lab! The superior dehumidification performance of the Autodesiccator model makes it a natural choice for more perishableand expensive products that require constant low humidity. Totally automatic, continual desiccation with silica beads, and generation every 20 minutes, keeps RH level in the SECADOR™ 4.0 Desiccator at a constant level. No long regeneration lag between cycles - minimal change from opening the cabinet door. Two fans guarantee continuous airflow within the cabinet, and continuous exhaust of humid air. To convert your Model 4.0 Secador™ Autodesiccator Cabinets or Secador™ Desiccator Cabinets from the Horizontal configuration to the Vertical, or from Vertical configuration to Horizontal, all you need is a new set of shelves. 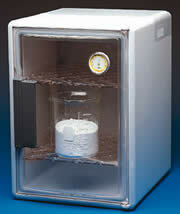 Dry, dust-free storage for use in refrigerators, freezers or at room temperature. These durable cabinets are made from 6.35 mm (¼") acrylic with full-length hinges and stainless steel twist locking latches. 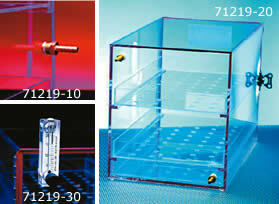 Choose from easy viewing clear units or dark bonze for light sensitive materials. Both offer deep, slide-in trays with perforated bottoms and are available in three sizes. Good for compact areas. It is see-through from all sides. The door is air tight when closed and when it is opened it slides into a hide-away compartment beneath the cabinet. Safely stackable up to five high. Inside measurements: 8¼"L x 7"W x 5"H (21 x 18 x 13cm) Outside measurements: 9¼"L x 8⅞"W x 6 5/8"H (23 x 21 x 17cm). Same construction as cabinet 1. Comes with two shelves and vent holes, four sets of shelf rails for adjusting to low or high objects. "Smoke" tinted in color. The door opening is 9" wide and 8" high (23 x 20cm); inside depth is 9". Overall measurements are 10 x10 x 10" (25 x 25 x 25cm). For dry, dust-free storage at temperatures up to 120°F. They can be used as incubators, freezers, and refrigerators or at room temperature. Cabinets have airtight doors that need no lubrication. Sliding perforated shelves for easy access; transparent acrylic walls for see-throguh storage. The third bottom shelf accommodates desiccants. 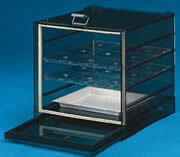 Cabinets are also available with locks and a hygrometer. 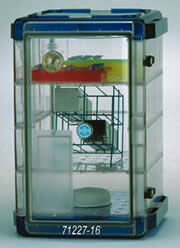 Hygrometer has a temperature range of -58°F to 158°F with ±1.5°F accuracy up to 104°F. Humidity range is 20 to 95% with ±5% accuracy. LCD display. Includes 2 'AAA' batteries. Simple and easy to use at temperatures up to 120°F. They can be used in freezers, refrigerators, or at room temperature. Cabinets have airtight doors that need no lubrication. Sliding perforated shelves for easy access, transparent acrylic wall for see-through storage. These cabinets are also available with Flow Meters. Direct reading scale flow meters with control levels that let you not only measure flow through the meter, but also make flow adjustments in the line. Acrylic, ethylene propylene, and Type 316 stainless steel welded parts. With a flow range of 2-20 with an accuracy of ±6%. Flow meter dimensions: 2" scale height x 4.125" overall height with mounting centers of 3". 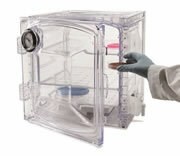 Made from clear methyl-methacrylate (Acrylic), this auto-desiccator cabinet features a permanent desiccant contained in the control unit; therefore, no desiccant tray is needed. The cycle is indicated by a green light for a 4½ hours absorption period, or a red light indicating ½ hour regeneration of the desiccant. This cabinet will lower relative humidity to 30-40%. The unit draws 6 watts, 120 VAC. The same construction and all features as the Vertical Cabinet but its layout is horizontal. The generator unit is on the side. The overall unit measures: 24½" Length x 15½" Depth x 13½" Height (61.6 x 39.37 x 32.93 cm). Efficient dehumidification is monitored by a hygrometer dial in the door. The dehumidifying auto-drying unit has an air circulating system which helps drop relative humidity sharply through its cycling of absorption and regeneration of the enclosed permanent desiccant. It can bring the relative humidity down from 60% to 10% in 6 hours of continuous operation in an unloaded cabinet. The unit comes with three clear, removable shelves with vent holes which provide evenly spaced storage area. It operates on 110 volts, 60 Hz., 10 watts, and comes with a 2-prong 6 ft (2 meter) cord. Precision machined from a block of aluminum - anodized black - this Sample Stub Vacuum Desiccators accommodates 18 SEM Mounted Sample Stubs, pin style, under vacuum for year long. Measures: 13 cm x 13 cm x 4.5 cm High. Chamber cavity is 10.4 cm diameter x 18 mm deep. Lid is made with 10 mm thick clear acrylic. EMS is proud to announce our complete line of Lab Companion™ Vacuum Desiccators that holds a vacuum three times longer than the average vacuum desiccator. Available in 14 models available to suit most needs, users can choose from a standard round style or a unique cabinet style with molded design that prevents implosion. 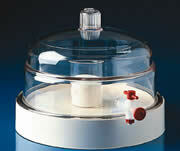 Choose from 14 models that hold a vacuum up to 3 times longer than the average vacuum desiccator. These high-quality vacuum desiccators provide vacuum integrity lasting three times longer than the average vacuum desiccator resulting in lower maintenance and greater peace of mind. Able to maintain 29"-Hg vacuum for over 72 hours at room temperature, they stay gastight allowing reliable storage, creation of anaerobic environments, degassing of materials or vacuum drying of samples over extended periods. Glass vacuum desiccators are versatile and are equipped with a sidearm for connection to a vacuum source. The contents of the sealed avacuated desiccators are maintained in a dry reduced pressure atmosphere. Dried materials are stored in desiccators while cooling in order to minimize the uptake of moisture. Lubricating the standard taper sleeve valve with silicone-based vacuum grease is recommended for increased performance and to prevent freezing. ¼" to ⅜" vacuum house required. Made from Wheaton "810" glass. 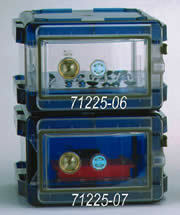 Replacement jars for all Dry-Seal desiccators. Replacement for all Dry Seal® vacuum desiccators. These rings are molded from chemically resistant Viton® rubber. Good for vacuum drying and degassing procedures. 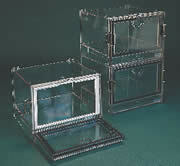 The chamber is made from a clear polycarbonate allowing for full visibility. Its polypropylene stopcock has a "PTFE" plug and it accepts ¼" (6.4 mm) I.D. tubing. The chamber measures: 7⅞" (20 cm) I.D. ; inside maximum height is 4⅜" (11 cm); plate is 1¾" (4.4 cm) H x 9⅛" (23.2 cm) in diameter. 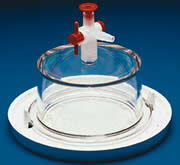 The top part of the desiccator is clear, molded from polycarbonate and see-through from any angle. A polyethylene stopcock with a "PTFE" plug allows for gentle releasing of the vacuum. A peripheral flange around the polypropylene bottom section fits into and snap locks therefore sealing the two halves against a "O" ring. Vacuum retention rating is 740 mm Hg (29"). Inside dimensions are 102 mm (4") diameter x 59 mm (2 7/16") high. The base is 175 mm (6⅞") diameter. 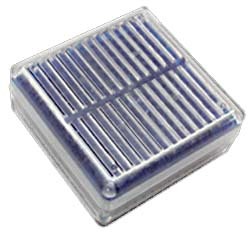 These desiccant cartridges can be used in desiccator cabinets or non-vacuum desiccators, analytical balance cases, and precision laboratory instruments. The clear polystyrene dish allows for instant visual inspection of the silica gel color which changes from blue to pale pink as it absorbs moisture. A highly porous membrane covers the dish of the desiccant providing good moisture absorption. The desiccant can be regenerated by heating cartridges in an oven at 50°C (122°F) overnight. For rapid drying, cut the membrane and transfer the spent gel crystal into a glass or porcelain dish. Then place it in a 150°C (302°F) oven for one hour. The silica gel is inert and non-toxic. Each cartridge is individually sealed in aluminum foil. Dispose of the cartridges after repeated use. Cartridges come in two sizes: Small: 2½" (65 mm) diameter and Large: 4" (100 mm) diameter. 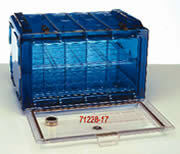 Ideal for dry control of desiccator cabinets. Moisture is absorbed through the perforations in the aluminum case, which contains silica gel. This 2x4" canister maintains a safe level of humidity in 3 cu. ft (0.8 cu. meter) area. When the monitor window turns pink, the silica gel is saturated. It can be regenerated in a 300°F (150°C) oven in about 3 hours. The monitor window will be blue in color when recharged. These cartridges fit into the bottom of a standard glass or plastic desiccator. The cartridge consists of a durable long wearing polyester felt bag with a perforated Mylar cover sealed in place. 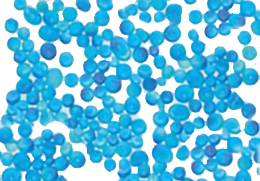 The indicating gel beads will change their color from blue when dry to pink when moist. Saturated gel can be regenerated in a 150°C (300°F) vented oven for 3 hours or more (depending on size), until the blue color is restored. Cartridges come individually sealed in a moisture-proof pouch ready to use. Fast and extra moisture absorbing agent. These packets lay flat, malleable to the storage area. Available in a variety of sizes. This small container offers more desiccant in less space. It is ship-proof and possesses greater drying capabilities. Designed for use in bottles and small containers. Perfect for protecting against potency loss, odor formation, color changes, caking, mildew and condensation. Capsule shell is made from polyethylene with very fine mesh top and bottom. The canister contains 1 gram silica gel. Capsule measures 9/16" dia. x 11/16" high (14 mm x 18 mm high). Silica Gel Desiccant will change color when it has reached the maximum adsorption capacity. Available in bulk (2 lbs). Used to dry out items. DriBox is a 2" x 2" x 1" dehydrating cartridge that will remove moisture and prevent corrosion in a 3 cu. ft. sealed container. The dark blue Desiccant will turn pink over time, indicating that it is ready to be regenerated. This is a popular item to use in a safe or other sealed container where moisture is a concern. This can be regenerated in a microwave for a few seconds at a time until the beads become dark blue again. An oven can also be used at 225 degrees for 3-4 hours or until the beads are once again dark blue. This Vacuum-Pressure Indicator fits between the desiccator dome and the desiccator stopcock. Its slips easily onto the tapered outlet of the desiccator dome and into the standard desiccator stopcock without requiring any tools.. The thermo-plastic elastometer collapses when there is negative pressure vacuum in the desiccator and expands under ambient atmospheric pressure. A polypropylene body which has a TFE plug and washer as well as a bright red handle and nut. Its taper fits on the desiccator port and the plug is 3-way allowing for vacuum draw, shut-off, and release. May be used with our following catalog numbers: 71230; 71232; 71234; and 71246. These 4.8 mm thick plates are able to withstand temperatures up to 150°C (300°F) and have excellent resistance to thermal shock, and to chemicals. They are non-combustible and asbestos free. Round plates are perforated with 4 mm (.165") diameter holes on 12.7 mm (½") centers in a straight line pattern. They are available in three sizes, and fit our following desiccators 71230; 71232; and 71234.